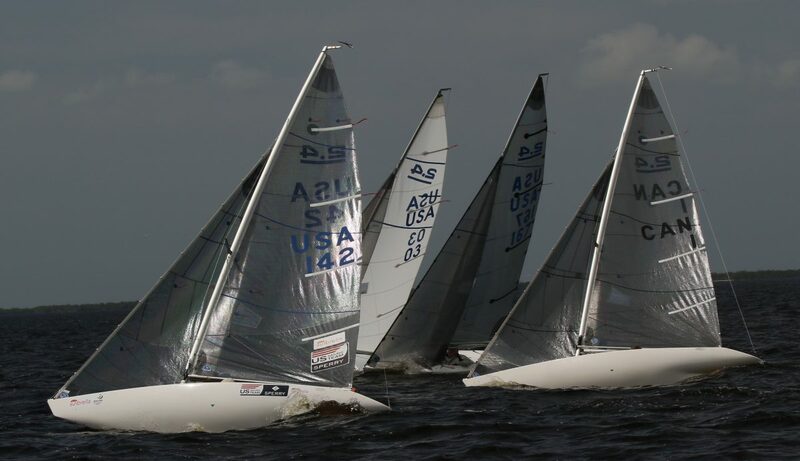 The US 2.4mr Spring Clinic was held at the Charlotte Harbor Yacht Club on March 10th and 11th. High winds with gusts to 30mph kept the fleet dockside until early afternoon Thursday. At 2:30pm most were able to get out for a practice race and some speed tuning. Friday started out the same, with most(all but 1) of the participants “voting” to stay dockside enjoying the sunny Florida morning until the wind abated a bit around 11:30am. Mark Bryant was on the coach boat offering on the water insight and advise to all. Steve Olive handled RC duties, with helpers Chalmers and Kayla, and Dennis Peck providing double duty as mark/rescue boat. The fleet got plenty of work on their starting routine as each race was prefaced by 2 practice starts. With a short line and good breeze everybody was reasonably well behaved and managed to keep their heads up while jockeying for position during the start sequences. All appreciated the extra practice, and Charlie Rosenfield proved unbeatable with 4 bullets Friday, winning the naming rights for the clinic. Tony Pocklington was second and Jay Corcoran edged Erick Poirier by 1 point for third. Special thanks to the Charlotte Harbor Yacht Club for accommodating the 2.4mr class for this fun event. CHYC hosted the Florida Council of Yacht Clubs Friday and Saturday which made for a very busy weekend at the club, and in the marina.